Course is designed to get you on top of the things on your mail box. The old ways of handling emails are out-dated and don’t work. Here we focus on habits, choices, actions, attention and energy. This workshop works on basis of advance level of productivity models and improved and consciously set habit patterns. 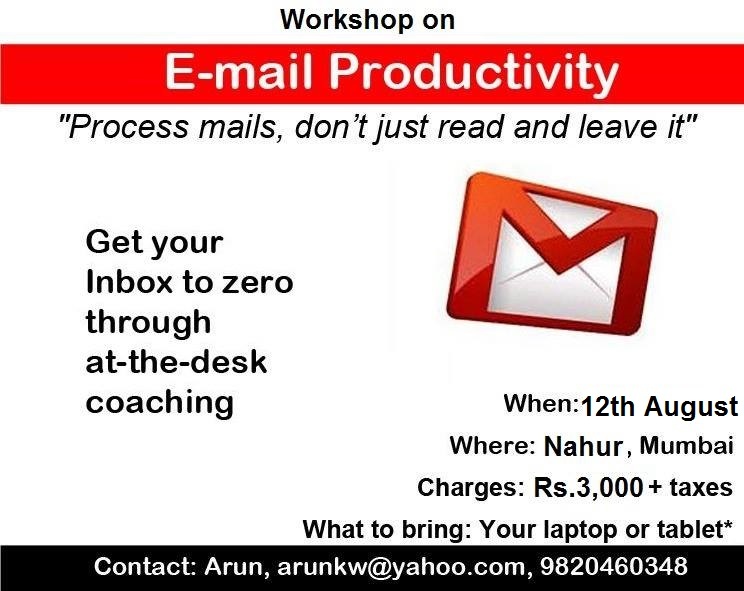 In this training you get your inbox to zero through ‘at-desk coaching’ inside three hours and you also get to learn how to use Mailbox as an organised e-Filing cabinet this eventually free up your time and energy. Applying the new approach and new habit on your inbox will not collapse your mailbox system this training is safe and secured it doesn’t change any underlying structure of your mailbox. You might be having mental alerts, notches and marking for many of the important mails in your inbox and in spite of using flags and priorities it’s insufficient to address these mails in totality, such that every time you see them it saps energy out of you and just looking at your Inbox makes you feel depressing. The biggest two myths that are sabotaging your work are ‘I need to be online 24 by 7’ and ‘I don’t have time to process the pile of mails in my inbox’ as the result it is making you downer. New system works based on advance level of productive and keeps your well organized in the current age of Information explosion. Don’t categories or label mails. Setting and meeting expectations, organizing and managing work which arises from mails in the form of calendar events, references and action items. Our training gets you on top of emails and gives you peace of mind by bringing inbox to zero. In this workshop teaches on how to organize and manage work which arises from mails in the form of calendar event, references and action items, etc. This training makes you ninja in processing mails and bringing it to zero.